The automaker Opel plans to expand its line of the new Astra model range sedan that will debut at the Paris Motor Show later this year. The car goes on sale after hatchback Astra, GTC-and OPC-versions, which, in turn, will be presented already at the Geneva Motor Show. 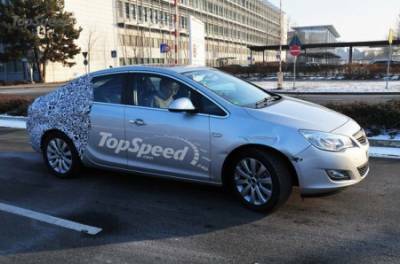 Spy shots show the new sedan, whose design is largely drew its inspiration from the hatchback. However, in the stern of the vehicle design can be traced notes Opel Insignia. The engine range will also be borrowed from the hatchback, meaning a choice of eight different engines, a couple who make a six-speed transmission. Diesel engines will be presented range from 1.3 to 2.0-liters capacity from 95 to 160 horsepower. Petrol - from 1.4 to 1.6-liters capacity from 100 to 160 horsepower.